Hundreds of power workers march in Baghdad March 24 to protest attacks by groups tied to former Baathist regime of Saddam Hussein on electricity generating installations. Banner includes names of their fellow workers killed in these bombings. Hundreds of workers in Iraqs power industry marched in Baghdad March 24 to condemn attacks by antigovernment bombers that have killed dozens of their co-workers. Groups that trace their continuity with the former Baath Party regime of Saddam Hussein have been largely responsible for such bombings. The same day, more than 200 workers held a protest outside the local government building in the southern port city of Basra demanding that the new oil and transportation ministers come from that region. Also in Basra hundreds of students marched on the school administration building at Basra University demanding prosecution of militiamen reportedly organized by supporters of Muqtada al-Sadr who had attacked a student picnic on March 15allegedly because men were playing music, dancing, and singingand beat two students to death. These actions, which cut across religious and other divisions, indicate that working people and youth in Iraq are beginning to use the political space they have today to push for democratic rights and defend their interests. No, no to terror! shouted hundreds of power workers as they marched in Baghdad, reported the Associated Press. The workers were lined up behind a black banner inscribed with the names of coworkers who had been killed in Baathist attacks on electricity stations and oil pipelines. During the protest in Basra the same day, oil workers delivered a statement to provincial governor Mohammed al-Waeli saying, Everyone must know that the oppressed and persecuted people of the south refuse to have their interests ignored, according to AP. We will stop pumping the oil and go on strike for those working in the oil fields and ports if our demands arent met, said Mohammad Abdul Hafez, an officer of the oil workers union and one of the organizers of the protest. Basra is one of the main centers of oil production in Iraq. 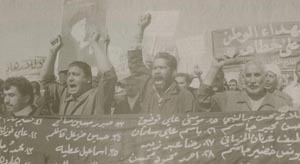 In 2003 members of the Basra Oil Workers Unions went on strike, shutting down oil production for three days, according to the union president. Workers struck to protest wage restrictions imposed by Washingtons former proconsul, Paul Bremer, who headed the occupation regime at the time. Meanwhile, security officials opened fire March 27 on 50 peoplekilling one and injuring otherswho were protesting at the ministry of Science and Technology in Baghdad. According to AP, the protesters were Iraqis employed by the ministry as security guards and were demanding their full pay. The following day, Iraqs interior minister, Falah al-Naqib, accused the protesting employees of having attempted to enter the office of Science and Technology Minister Rashad Mandan Omar. He said Omars bodyguards were doing their job to protect the minister when they fired into the crowd. Haitem Jassim, one of three people injured in the shooting, told the press the employees were unarmed. Al-Naqib warned against anyone holding protests in the future, claiming they are an invitation to terrorist attacks. On March 15, about 20 to 40 militiamen reportedly loyal to Shiite cleric Moqtada al-Sadr attacked a picnic of several hundred University of Basra students. Al-Sadrs militia fought fierce battles with the U.S. military in Najaf and parts of Baghdad last year. The attackers used clubs, wire cables, and brandished pistols and rifles, according to AP. Students said police were present but did not intervene, according to the Washington Post. At least 10 students were detained by the militiamen and taken to their local offices but released later that evening. Two students were beaten to death, reported the London Times. They started shouting at us that we were immoral, that we were meeting boys and girls together and playing music and that this was against Islam, Ali al-Azawi, an engineering student who had organized the picnic, told the Times. The next day, about 150 students marched on the university presidents office. They demanded punishment of the militiamen involved in the attack, an official apology, return of property stolen from them by the attackers, and dissolution of the security committees that function as morality police in each university department and their replacement with Iraqi army troops. Classes were canceled and the students vowed to remain on strike until their demands were met. The university students continued their protest the following day with a march to the governors office. Their action inspired hundreds of students from smaller colleges and a few high schools to join them. After a two-hour meeting involving city officials, the governor, members of al-Sadrs group, student representatives, and school officials, the city council president announced that the students demands would be met. Another indication of increased political space for many Iraqis is the spreading availability of once-banned books. In the Renaissance Bookstore on Mutanabi Street in Baghdad, for example, once-banned books are selling well, according to a March 20 Washington Post article. Among the titles are books by communist poets and martyred clerics, translations of Shakespeare, a 44-volume tome by a revered ayatollah and stories by Gertrude Bell, a British archaeologist and adventurer, the Post said. Among the most sought after, said store owner Mohammed Hayawi, are language booksEnglish, French, Turkish, and Farsibooks he described as passports to the rest of the world. Hayawi told the Post he opposes the U.S. occupation but took part in the U.S.-orchestrated elections in January. He said he is a devout Muslim but dislikes the meddling of religious officials in politics. He also said he is a Sunni but resists identifying himself as such.